With school starting accross the country over the next few weeks, there is a proliferation of peanut butter bars on Pinterest. Most of these recipe start with a box of cake mix. I have no idea why cake mix is viewed as easier as it surely can’t possibly be any easier than this recipe. In any event, whether you have school aged kids or not, if you love peanut butter, you will really enjoy this recipe which I adapted from Maida Heatter’s wonderful book on Great Cookies published in 1995. I got my copy from my dear mother-in-law Diana Shafroth who had dozens of pages in the book marked for trying. 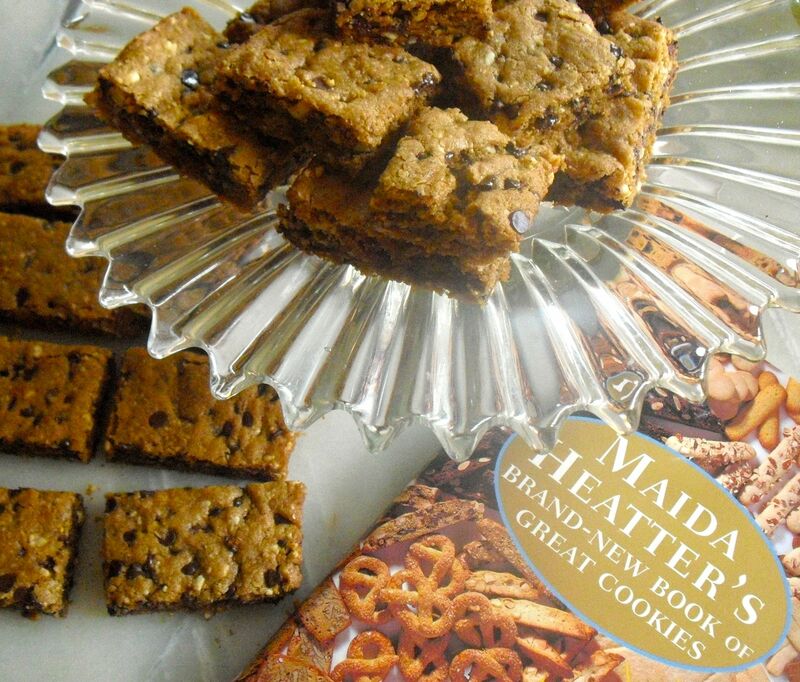 If you don’t know who Maida Heatter is, she is a legend in the baking world. This 2002 article from Saveur magazine sums up why she was so beloved. 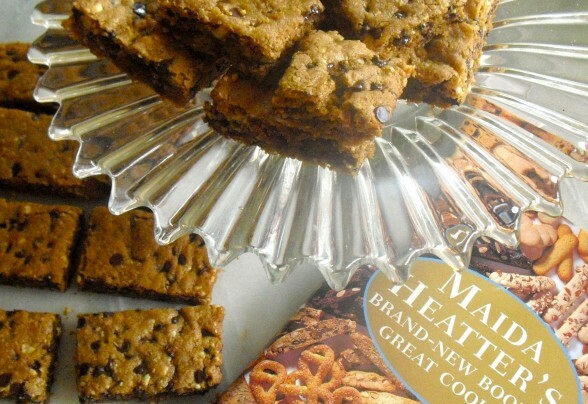 In any event, these chocolate chip peanut bars are delicious. Equally as wonderful is her recipe for Ethiopian Truffles. Preheat the oven to 350 degrees. Spray a 9 x 13 inch rectangular pan and line the bottom with parchment. In the bowl of a food processor pulse the peanuts and sugar into a crumbly mass. Sift together the flour, salt and baking powder. Beat the butter with the brown sugar, vanillas and peanut butter until smooth. Add the two eggs and then add the flour mixture. Add the chocolate chips and peanut/sugar mixture. Press the dough into the prepared baking pan and place into the oven. Bake for 15 minutes then rotate the pan and bake for a final 13 minutes. Remove from oven and allow to cool completely. Remove from pan. Cut. Serve. Enjoy.